Premises of second floor are simpler decorated, and were used as a dormitory for guests who came to visitation. Here are separately exposed furniture collection distributed by stylistic periods from Baroque to Renaissance. The room is furnished in the style of the German Baroque. Cabinet locker, bed, cabinets and chests date from the 17th century, and the chairs are made by the French model. Interesting tables: one on the assembly, and other for card-playing. Special emphasis is richly painted oval mirror and chandelier from the 18th century. Baroque room is different from the other rooms on that floor by old preserved wooden doors that are located outside the entrance to the room. Goal post are in relief derived doorframes and beam with carved capitals and figures: 16 PB AS 39. Figures indicate 1639. year. 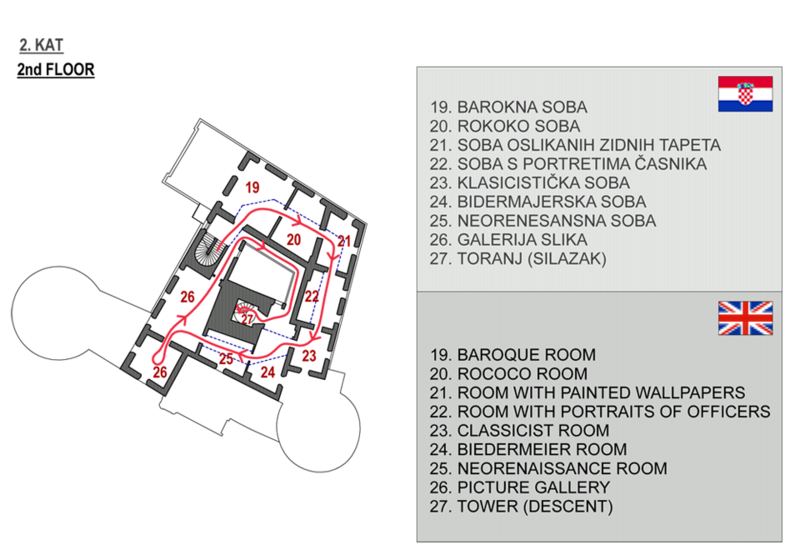 Letters PB AS were shortcuts and are related to the function of the room (presbiterium ara sacra), because probably in the 17th century served as a chapel. Rococo room is presented in two parts as a workspace located on the left and the dorm rooms on the right. Entire inventory dates from the second half of the 18th century. In part with cabinet are two finely carved and decorated writing desks - with drawers and secret compartments. In the spirit of rococo there are also family portraits in oval frames, incurred in the first half of the 18th century, and continue to be one of the Knights' Hall, where are exposed the rulers and generals. The room is lined with cloth wallpapers that give a complete picture of Draskovic troops who participated in the seven-year war (1756 to 1763). Large wall painting consists of eight canvas panels painted with watercolors that show regiment on the parade, made up of 821 people. Pictures are very faithful in small things because they show soldiers uniforms, equipment and flags, and the order of individual units and their parts. Of particular interest is a small orchestra, the first fine arts display of military music in Croatia. Thematically this room is linked to the previous room. Here is the exposed portion of the gallery of forty portraits an officer Joseph Casimir of Draskovic. Portraits are probably the work of Johann Michael Millitza and his school. All officers are painted in similar positions, to the waist, with realistic faces shown. Their similarity arises from the uniformity of their hairstyles and uniforms. With portraits of military officers, here are located two flags. Smaller flags on the swallow tail belonged to the cavalry, while a large banner with the royal coat of arms was designed for infantry. The room is furnished with inventory stylistic characteristics of classicism (the transition from the 18th to 19th century). Includes furniture for the living room. Space is completed yet with two candlesticks from the time of Napoleon, made under strong Egyptian influence. Paintings are also Classicist style with well-preserved original frames. Portraits on the walls represent the most significant members of the family Draskovic of that time. So here are portraits of John VIII., founder of the first Masonic Lodge in Croatia and George V., the younger brother Janko. Building on the the classicism Biedermeier is style appearance in 1815th and half of the 19th century. Furniture of this period is comfortable and functional, and polished as can be seen on the Trakošćan example. The partition wall is a lithograph showing the Imperial and Royal Austrian family with a portrait of the late Emperor Francis I. In this room are interesting portraits typical of Biedermeier painting. Renaissance is a form of historicism that occurs in the second half of the 19th century. Featured pieces of furniture in this room are painted black, and part of the furniture brought in dowry painter Juliana Erdődy, which tells us the letter E in the upper part of the buffet. It should be emphasized original dresser from the Renaissance period, the oldest piece of furniture in the museum. This fine piece of furniture fits into the rest rooms on the right, although older than him for three centuries. Here is one of the most beautiful portraits in the castle: portrait of Klotilda Draskovic, born Kulmer. In the gallery of the castle Trakošćan are four paintings of famous Biedermeier painter Michael Stroy. All images are makes allegorical cycle titled "Four Continents". The continent of Asia, Africa, Europe and America, are presented personifications of women placed in the interior atmosphere and landscape. Paintings were made in 1836. and to them it is evident view of European person through the prism of romance, the exotic land far away continents. The gallery presents a children's portraits of family members of Draskovic, resulting in a range from the late 16th until the mid-18th century, and which make a whole that is unique to the northwestern Croatia. Outstanding historical source for the study of everyday life, fashion and accessories wearing by nobility of the time. Associated attributes, animals and plants, indicating a high social status and wealth of the family in which they were born.